Manufactured to British Standard BS2037-1994 Class 1, for Industrial use. Platform size - 406 x 254mm. Made from heavier gauge material. To reach above ground levels in an industrial work setting you need a reliable way to reach those heights. 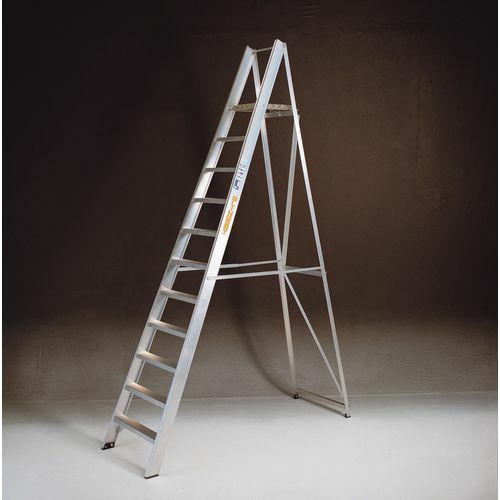 Our heavy and extra heavy duty folding platform steps provide excellent stability to support you with any task you are performing up high. Manufactured to British Standard BS2037-1994 Class 1, these ladders are specifically designed for industrial use, meaning that they are high quality and strong. They are made from heavier gauge material with serrated aluminium treads for brilliant under foot grip, allowing the user to mount and dismount them without having to worry about the possibility of slipping. They are foldable for easy storage when not in use and all of these steps are fitted with rubber studs to the base of the back legs and sides to give better stability on slippery and difficult surfaces. Our heavy and extra heavy duty platform steps are available in a choice of five platform heights; 2590mm, 2820mm, 3280mm, 3510mm and 3760mm. They have FREE UK Delivery and a 12 month guarantee.